“Ginger” has our full-depth Keystone tenor body and a 17 inch scale. This is currently the largest ukulele we make and it’s also our most popular. The full-depth body gives her a big voice and there’s plenty of room for bigger hands to play on the fretboard. She’s also electric, with a K&K Sound Twin Spot internal pickup installed. Ukulele “Ginger” because of her beautiful Redwood soundboard gets her name from a famous shipwrecked redheaded moviestar. So sit right back and enjoy! “Ginger” will be attending the Tahoe Ukulele Retreat November 9-12, 2012 an the shore of beautiful Lake Tahoe. 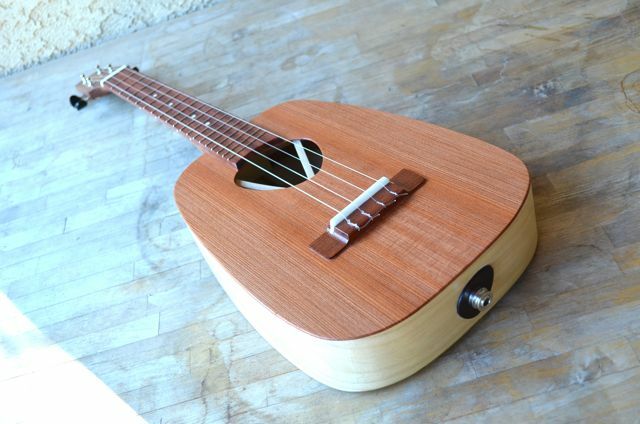 Introducing ukulele “Ginger” an electric/acoustic Keystone with a quartersawn Redwood soundboard.